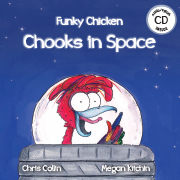 The Funky Chicken rockets into Space for a planet-hopping adventure, in Chris Collin’s third book about the wacky chicken with an over-active imagination. I have grown to love this chook character that I confess is absurd but endearing. On Bob and Sue’s Egg Farm outside of Humpy Doo, Funky Chicken has dreamed up another grandiose scheme. He wants to be the first ever chook astronaut. He imagines finding feathered family in Outer Space. But how will the inspired chook fulfil his dream this time? Lots of scrap and rubbish can be found. Funky Chicken and friends join together in a monumental project that could become historical, as well as hysterical. But where will this adventure lead and what exactly is the chook searching for in Outer Space? What’s more, how long can the scrappy rocket hold out? All is revealed in a clever, classic rhyming feast of words, and vibrant images created by the talented Megan Kitchin. Chris has created a spirited and lively character that becomes more daring with each adventure. Funky Chicken is vain, confident and incredible. His fearless, I-can-do-anything approach to life and having fun is infectious. Each book in this series comes with an Audio/Visual CD with instructions. You can view slideshow/videos of the song and book set to music. The music is catchy, and I see before me delighted children singing, dancing and swaying to the funky mix. I love this series. Its poetic stories offer children an alternate form of reading.